Anyone who suffers from hyperhidrosis understands the challenges, limitations, and discomfort it causes in day to day life. The most common form of hyperhidrosis is palmar hyperhidrosis, the severe sweating of the hands. Fortunately, there have been significant improvements in the treatment of palmar hyperhidrosis mainly in part due to endoscopic thoracic sympathectomy (ETS) surgery. ETS surgery is the most effective treatment for patients with severe palmar hyperhidrosis. Introduced in the early 1990’s, ETS for hyperhidrosis has evolved significantly as our understanding of the pathophysiology of palmar hyperhidrosis has increased. The ETS surgery procedure is a very safe minimally invasive procedure performed as an outpatient. Our patients leave the hospital several hours after the procedure and resume all of their normal activities within several days of surgery. The surgical technique of the ETS procedure varies significantly between surgeons, which accounts for the dramatic difference in outcomes reported in the literature. At the Center for Hyperhidrosis at New York Presbyterian Hospital, we follow our patients and perform post-operative surveys to assess their results from the ETS surgery. This is the only way to know if our technique is achieving the desired outcome of relieving palmar hyperhidrosis, without creating new unwanted symptoms. Over the past 18 years we developed minimally invasive ETS-T3, for patients with severe palmar hyperhidrosis, and patient satisfaction exceeds 98%. ETS treatment procedure is minimally invasive and performed under general anesthesia, where two microscopic incisions are made in the armpit. These small incisions are barely visible within weeks of surgery. Using CO2 insufflation to compress the lungs, a small camera is placed into the chest cavity. During ETS treatment, we do not deflate the lungs, and therefore after completing the procedure, the lungs quickly return to their normal size and function, usually without any side effects. After fully identifying the sympathetic nerve anatomy, we isolate the T3 ganglion from the rest of the sympathetic nerve by placing a very small titanium clip above and below the T3 ganglion. After completing the ETS treatment procedure, the CO2 is removed from the chest cavity, and the lung should quickly return to normal. We then perform the same ETS procedure on the other side of the chest. Each microscopic incision is closed with a small single absorbable suture and a waterproof bandage so that you can shower the next day. There is rarely any need for strong post-procedure pain medication, and most patients resume normal activities with several days. ETS side effects will range patient to patient, but overall should be very minor. 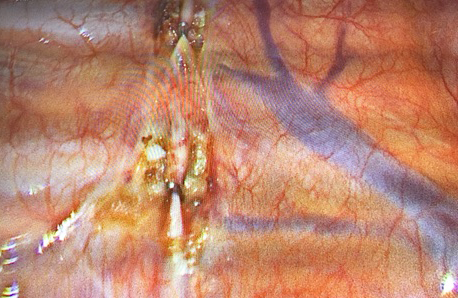 There may be some sensitivity at the incision site immediately after the procedure, but patients should not anticipate scarring. In our experience with ETS surgery, there is rarely any need for strong post-procedure pain medication, and most patients resume normal activities with several days. One potential palmar hyperhidrosis surgery side effect is compensatory sweating. Compensatory sweating is the excessive sweating of the stomach, legs, thighs, or back. Fortunately, patients treating palmar hyperhidrosis are least likely to experience compensatory sweating compared to other forms of hyperhidrosis. At the Center for Hyperhidrosis, we utilize a technique called ETS-T3, which results in the least amount of post-procedure compensatory sweating. Because we have performed ETS-T3 on thousands of patients, and have also performed detailed follow-up questionnaires, we are confident in the results you will see. After awakening in the recovery room, you can expect your hands to be dry and never to sweat severely again, although results can vary. Most patients also achieve significant improvement in armpit sweating (about an 80% reduction in severity). Up to 50% of patients also achieve significant reduction in sweating of their feet. The pathophysiology of both the reduction of foot sweating and the development of compensatory sweating is unclear. We believe that our technique of ETS-T3, results in the least amount of compensatory sweating, and excellent patient satisfaction.